One of my culinary bucket list items was to successfully make a loaf of bread. I can remember watching my grandma make bread and buns when I was younger that smell that comes with fresh baked bread. I decided recently that I wanted to take the chance and really make an effort to produce a loaf of bread. Even if it wasn’t an ideal perfect loaf I would at least be able to tell myself I tried. Today was the day. 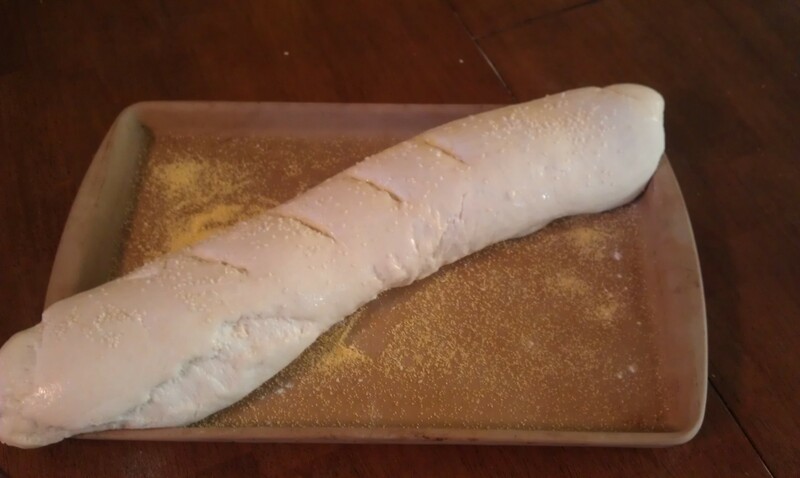 I went with a Traditional French Bread recipe from my WestBend Bread Machine Cook Book. I have arthritis and find an assist in one way or another will make it easier to tackle my culinary tasks. So I used my bread machine to make the dough for me. When the machine had dealt with the initial blending, kneeding and the first rise I placed it on my table to rest for 15 mins. 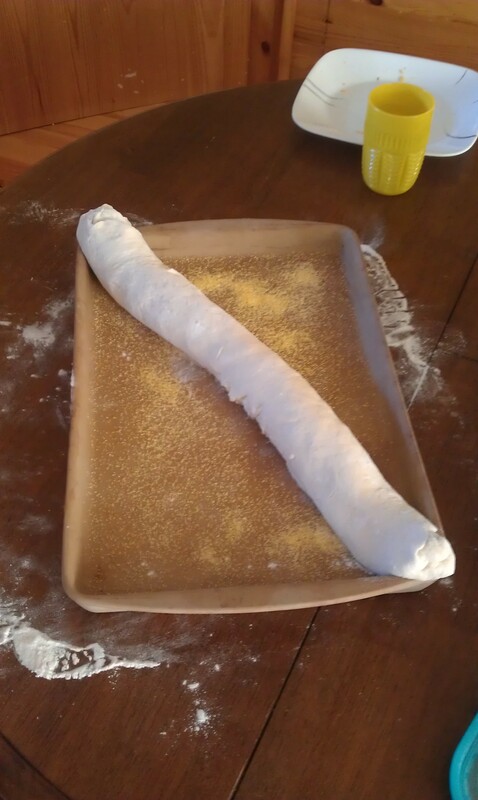 After the 15 minute rest I rolled out the dough and proceeded to tightly roll it along the long side and make my loaf and placed it on my long bar pan which I had put some cornmeal on to prevent sticking. Loaf rolled and placed on the pan. First thing I notice is that my loaf is longer than my bar pan. So first lesson learned…the loaf probably needs to be a bit shorter. However, overall I’m happy that I have gotten the loaf as the recipe suggests. It is rolled nicely and a good size so I will consider it a win :D.
I cover my loaf with a clean tea towel and tuck into my oven as I need to put the pan somewhere with no drafts that is warm and hidden from little curious fingers. After 40 minutes in the oven I bring out loaf and score the top. Then a brush with egg white and a sprinkle of sesame seeds. I’m feeling pretty confident that this is working out well. Honestly it looks better than I thought it would for my first attempt. 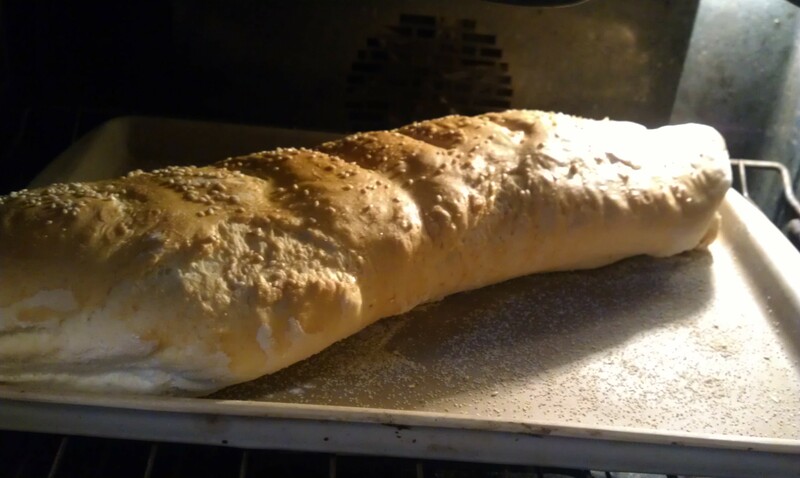 I was overjoyed when I peeked in when the timer went off and found this amazing golden loaf of French Bread in my oven. I was successful in my first attempt in that my loaf was cooked nicely and edible. I learned though which is always the thing when I cook or bake. There is always something I need to work on. Something I need to learn and about 100 questions I end up asking Kevin about what is a dice, what is a boil, does this look good to you…. I got many compliments on my first loaf and I’m pretty proud of it. I served it with this Chicken Bacon Chowder recipe from A Taste of Home. I did a few modifications on the recipe. I roasted my boneless, skinless chicken thighs slowly in the oven in a small Corelle Crock with a lid. I then used the drippings in the chicken stock portion of the recipe to give a bit more flavour. I’m also feeling pretty grateful for our mini chopper. Best $8.00 we spent on a kitchen appliance. I used it to dice the onions and then get the bacon finely chopped after I cooked it. If I wanted to make the soup on a week night for a warm up on a cold night I’d go with a rotisserie chicken from the local grocery store to make up the cooked chicken component. From start to finish it took about 30 mins to make the soup and we enjoyed it in our home on a -30 winter day. So today I successfully baked a loaf of bread and made a big pot of soup to enjoy with it. Pretty good day for a newbie cook. Posted on January 19, 2013 by Shirley Robert	• This entry was posted in Recipes and tagged bacon, baking, bread, chicken, cold, kitchen, recipe, soup, success. Bookmark the permalink. It is a great for dough. My husband and I have used ours for buns and pizza crusts and it turns out well. Hi there you have a good website over here! Thanks for posting this interesting stuff for us! If you keep up this great work I’ll visit your blog again. Thanks!